In May and June, all over Holland, schoolchildren walk 5 or 10 km together with their parents four evenings in a row. It is called the Avondvierdaagse - "evening-four-day". It is an old Dutch tradition from the 40s that has become a part of the Dutch culture. Last Thursday the crowd passed by our house. 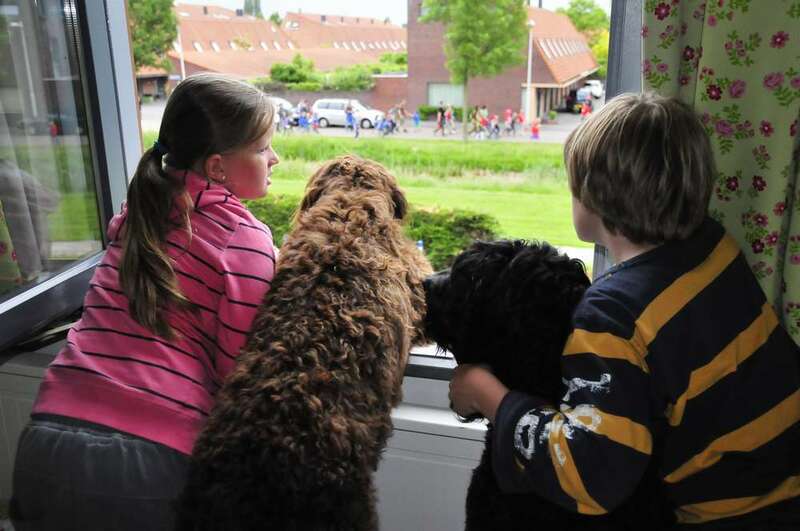 Kids and dogs found it interesting to watch the crowd from the top floor window! We decided that we will participate next year. We even saw some dogs walking with the crowd so I guess next year will be a premiere for Barbets to do the Avondvierdaagse. Or? Anyone that brought their Barbet along before?